Now just one choice in a sea of premium releases, 2018 Panini National Treasures Baseball still carries clout with high-end collectors. The all-hit boxes feature eight autographs or relics with at least one being a booklet. 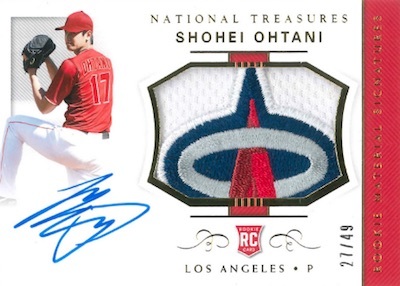 Just like 2017 had Aaron Judge, the 2018 product is buoyed by considerable rookie talent, including hard-signed (and live) Shohei Ohtani autographs across multiple sets. 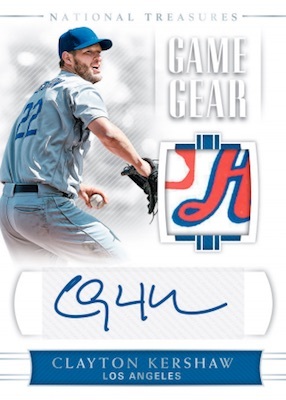 The main rookie offering in the 2018 Panini National Treasures Baseball checklist is found in Rookie Material Signatures. Featuring an on-card signature and swatch piece, the lineup boasts top names such as Acuña, Albies, Hoskins, Ohtani, Soto and Torres. Other RC options include Rookie Signatures and Rookie Triple Material Ink. Also hard-signed, Signature Names Prime showcases a die-cut text relic specific to the player while Signature Jumbo Die-Cut Bat works with a player silhouette over a bat piece. Touching on multiple decades of MLB greatness, additional signatures can be found in Century Materials Signatures, Game Gear Signatures, Hall of Fame Signatures, Player's Collection Signatures, Retro Signatures, Signature Names, Stars and Stripes Autographs, and Treasured Signatures. Filling in the other part of the box hits are the various memorabilia cards. 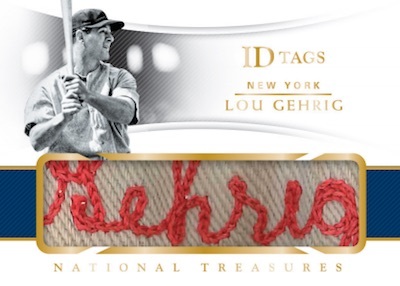 2018 Panini National Treasures Baseball provides a new assortment of gear, including relic sets for Bat Nameplates, Cleats and ID Tags. There are also Century Materials, Game Gear and Hall of Fame Materials cards to chase. 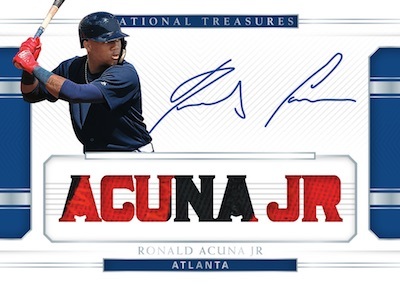 Averaging one per box, the most visually impressive collectibles in 2018 Panini National Treasures Baseball might just be the multi-panel booklets. Mixing in either autographs, relics, or both, these devote a lot of space to one player or more. 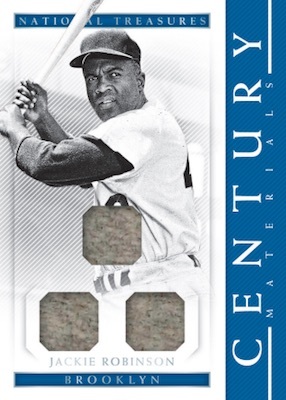 Legendary Lineups is a franchise-based insert with nine different player relics on the tri-panel booklet. There is also the dual-panel NT Signature Material Booklet with a quality swatch joining the on-card autograph for key prospects and star players. However, from the standpoint of baseball history, nothing can match the one-of-one Babe Ruth / Lou Gehrig Cut Signature Booklet. Other book cards include Franchise Lineups, New York Row and Rookie Signature Jumbo Material Booklet, plus Quad Signatures and Six Signatures. Shop available 2018 National Treasures Baseball cards on eBay. PARALLEL CARDS: Gold #/49 or #/25, Holo Gold #/25 or #/10, Holo Silver #/10 or #/5, Platinum 1/1, Brand logo 1/1, Tag 1/1 (No Banda*), Printing Plates 1/1. PARALLEL CARDS: Prime #/25 or less, Tag #/10 or less, Button #/8 or less, Brand Logo #/5 or less, Platinum 1/1, Printing Plates 1/1. PARALLEL CARDS: Gold #/49, Holo Gold #/25, Holo Silver, Platinum 1/1, Tag 1/1, Printing Plates 1/1. PARALLEL CARDS: Gold #/49 or less, Holo Gold #/25 or less, Holo Silver #/10 or #/5, Platinum 1/1, Brand Logo 1/1, Tag 1/1, Printing Plates 1/1. 2 cards. Serial numbered #/99. PARALLEL CARDS: Gold #/49, Holo Gold #/25, Holo Silver #/4 (No Bader*) Platinum 1/1, Brand Logo 1/1, Printing Plates 1/1. 20 Gold cards and 23 Holo Gold cards. 17 Prime cards and 18 Platinum cards. 25 cards. Serial numbered #/25 or less. CARD VERSIONS: Holo Silver #/25 or less, Holo Gold #/10 or less, Prime #/10 or less, Button #/8 or less, Tag #/5 or less, Platinum 1/1, Brand Logo 1/1. 4 Base and 10 Gold cards. PARALLEL CARDS: Platinum 1/1, Tag 1/1 (No Tiant*), Printing Plates 1/1. PARALLEL CARDS: Tag 1/1, Printing Plates 1/1. PARALLEL CARDS: Gold #/49, Holo Gold #/25, Holo Silver #/10, Platinum 1/1, Tag 1/1, Printing Plates 1/1. 32 subjects. Serial numbered #/49 or less. CARD VERSIONS: Gold #/49 or less, Bat #/25 or less, Prime #/10 or less, Platinum 1/1, Tag 1/1, Printing Plates 1/1. 8 Prime and 14 Platinum cards. PARALLEL CARDS: Prime #/10 or #/5, Platinum 1/1. PARALLEL CARDS: Prime #/25 or less, Holo Silver #/10 or less, Tag #/10 or less, Black #/5 or less, Platinum 1/1, Printing Plates 1/1. PARALLEL CARDS: Holo Silver #/25 or less, Holo Gold #/10 or less, Prime #/10 or less, Tag #/3 or less, Platinum 1/1. PARALLEL CARDS: Holo Silver #/25 or less, Holo Gold #/10 or less, Prime #/5 or less, Tag 1/1, Platinum 1/1. PARALLEL CARDS: Holo Silver #/25 (Sisco #/15*), Holo Gold #/10 (Sisco #/5*), Platinum 1/1, Brand Logo 1/1, Tag 1/1 (No Fowler*), Printing Plates 1/1. PARALLEL CARDS: Holo Silver #/25 or less, Holo Gold #/10 or less, Prime #/10 or less, Platinum 1/1, Tag 1/1. 16 cards. Serial numbered 1/1. PARALLEL CARDS: Holo Silver #/25 or less, Holo Gold #/10 or less, Prime #/10 or less, Tag #/5 or less, Platinum 1/1. PARALLEL CARDS: Holo Silver #/25 (Nick Williams #/10*), Holo Gold #/10 (Nick Williams #/5*), Platinum 1/1. 7 Holo Gold and 11 Platinum cards. PARALLEL CARDS: Nicknames #/49 or less, Statlines #/49 or less, Statlines Variation #/25 or less. PARALLEL CARDS: Nickname #/25 or less, Statline #/15 or less, Statline Variation #/15 or less, HOF Class #/15 or less, City #/10 or less. See the full 2018 Panini National Treasures Baseball checklist spreadsheet. Damn releases in a few hours and still no checklist?? What in the world Panini??!! Damn, looks like a great checklist. Panini stepped it up this year! Can’t wait to watch a few breaks. If you are a Pirates fan this is not the product to buy. Stay away. I just watched 9 case breaks and saw 4 or 5 Pirates. Very disappointing. I hear you !! I am Tigers fan & other than Cabrera / 99 not likely to get a card !